Bengali cinema has produced so many brilliant film makers over the years that it is easy to determine it is predominately auteur led as opposed to the preponderance of genre often associated with the Mumbai film industry. Born in Calcutta, Bengali director Goutam Ghose (also known as Gautam Ghosh) has produced work including documentaries and feature films whilst also being credited as a cinematographer, writer and composer on a number of Indian art films. He is obviously multi talented and somewhat prolific but nevertheless his absence from the discussions of Bengali cinema and Indian art cinema yet again stresses a pertinent need to catalogue with some trepidation key directors and films that construct a strong argument for parallel cinema’s sustained political engagement with the social. Writer Subhajit Ghosh offers one of the best overviews of the director’s work, emphasising his ‘strident political activism’ which of course is more than well represented in his 1984 film Paar (The Crossing). The IMBD entry for Ghose underlines a filmography made up of a string of documentaries, emphasising a concern with realism and political issues. It might be the case that his documentaries are probably far more political and radical than his feature films. His first Hindi film Paar is a tough watch in many respects. Featuring a towering central performance from Naseeruddin Shah and supported by Shabana Azmi, Om Puri and Anil Chatterjee. I guess, Shah, Azmi and Puri was the perfect cast for a parallel film from the 70s or 80s – all three continue to work tirelessly and remain hugely influential. With the success of Ankur and Benegal’s focus on rural exploitation, parallel cinema made this into a virtual trademark. Paar also explores feudalism and exploitation of the untouchables in Bihar but unlike Ankur which hints at the potential for peasant revolt, Paar sees a worker, Naurangia (Shah), retaliate against the oppressive system by avenging the murder of the local schoolteacher who initially helps the workers to unite and resist. However, Naurangia and his wife, Rama (Shabana Azmi) are forced to flee when the villagers are massacred in a night of carnage. A despondent Naurangia and pregnant Rama end up in Calcutta and this is where the film becomes much darker and visceral in its impact. Survival becomes the only aim for both the impoverished husband and wife and soon they are faced with a life and death ultimatum. Homeless, destitute and starving, Naurangia’s only chance of making some money comes in the form of an absurd proposition; to take a herd of pigs across a river crossing. A Herculean task and the centrepiece of the film’s narrative, the desperate image of Naurangia and his pregnant wife Rama trying to stay afloat whilst directing the pigs across a wide river crossing morphs into a symbol of human struggle. Admittedly, this is a film of two halves and whilst the first half tends to offer some kind of sociological explanation why Naurangia is forced to flee the village, the second half dispenses with narrative concerns and depicts with great intensity an odyssey of pain and determination. Ghose seems unconcerned exactly where Naurangia and Rama are headed as it is their physical exhaustion which he captures so vividly through the hard edged cinematography and frantic performances. Paar is another key work of parallel cinema and Ghose is an auteur who seems equally impressive as Shyam Benegal, Aparna Sen or even someone as radical as Mrinal Sen. It will be interesting to see how the rest of his work stands up to the beauty of Paar. I’m not sure but I think Paar was also funded by the NFDC. Haven't seen Paar, Omar, but Yatra is one of the finest Indian films I've seen. And I'd say Ghose is pretty talented. 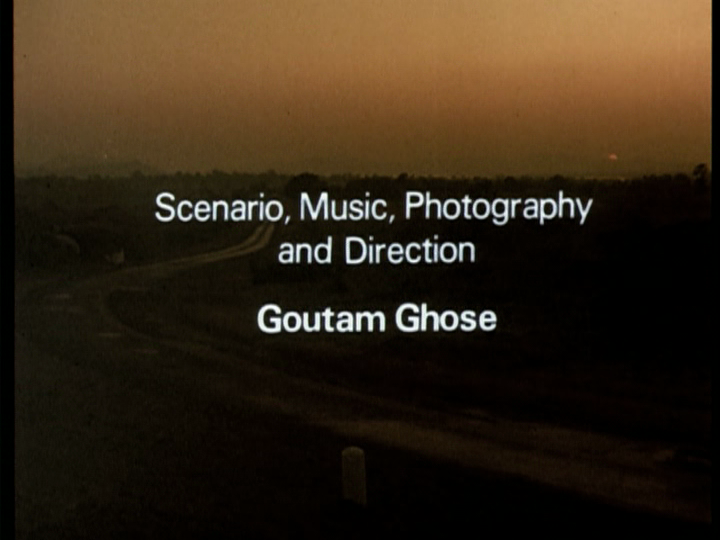 So far, the best movie by Goutam Ghosh. He brought out such towering performance from Naseeruddin in his very first directorial venture is hugely commendable. This entry was posted on November 13, 2010 by Omar Ahmed in Auteur, Goutam Ghose, Indian CInema, Naseeruddin Shah, Om Puri, Parallel Cinema, Political Cinema, Shabana Azmi, Social Realism.